Ask The Ripped Dude: What's The Best Form Of Cardio For Fat Loss? The World's Most Ripped Fitness Model, Obi Obadike, explains the best form of cardio for fat loss. Many different forms of cardio can help you get lean and ripped. Unfortunately, many people don't like doing cardio because it can be boring and monotonous. Cardio doldrums violate the first rule of fitness: The best workout is the one that makes you come back for another workout. That's why it's so important to implement fast, effective and fun cardio. So instead of giving you one pick, I offer two: jumping rope and sprinting. Each can turn you into a fat-burning pyromaniac. Let's start with jumping rope, which has to be one of best fat-burning cardio workouts in existence. Not only does it work your lungs, but it also tones your legs and lower body. Your brain will feel better. Jumping rope can produce a major endorphin buzz. Convenient: You can pack your jump rope in your suitcase or backpack and take it anywhere in the world. Efficient: Jumping rope can burn up to 1,000 calories per hour, making it one of the best aerobic athletic workouts around. Inexpensive: A jump rope shouldn't cost you more than $10 at a local sporting goods store. You are a high flying fat burning machine! My second choice, sprinting, is even cheaper. I incorporate sprinting into my weekly training routine. Why? It increases my metabolic rate for days, keeping my metabolism firing on all cylinders throughout the week. Not only is sprinting great for fat loss, but it can sculpt your legs tremendously. When you sprint, your accelerators are your quadriceps and your decelerators are your hamstrings. For that reason, sprinting is arguably the best legs exercise you can apply without touching a single weight in the gym. Sprinting and the resulting metabolic bursts also better retain lean muscle mass than longer, slower cardio sessions. The latter can actually be catabolic. Notice how scrawny most marathon runners appear, versus lean and muscular sprinters. A good sprinting workout doesn't end with lungs and legs. Sprinting also taxes abdominals and the rest of your core. Try this: stand and lift your leg in the air ... feel your abs contract? 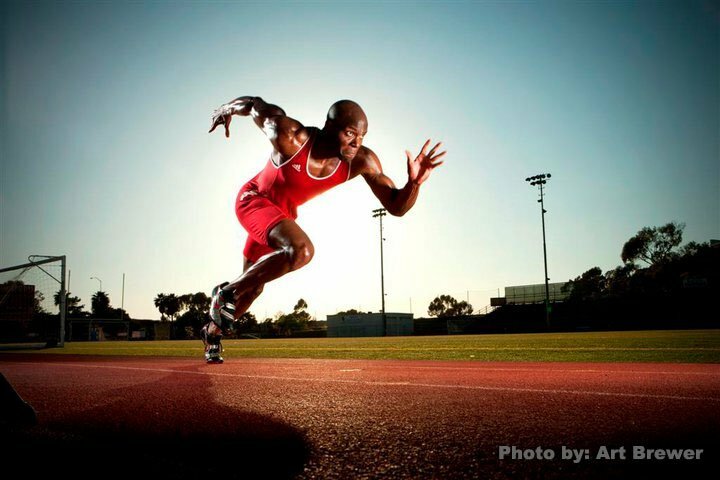 Imagine sprinting for a 100 meters ... your abs work like crazy lifting your legs off the ground while accelerating. I argue that a solid sprinting routine can serve as a stand-alone ab routine. If you think that's bunk, just look at my abs. Pow! If you run fast enough the fat can't keep up. The eggheads have my back on this one. Many studies have shown that sprinting is more effective for fat loss than low-intensity cardio. Australian researchers had 15 females perform 45-minute cardio sessions and compared their results with 15 females doing high-intensity intervals. The HIIT cyclists lost six times more body fat in just 15 weeks! That's crazy! Bear in mind, you can do high-intensity intervals by sprinting or jumping rope. Add these dynamic workouts to your routine a couple times per week. Assuming your diet is tight, the fat will head for the hills even faster than you sprint up them. Beginner Strength: Where Do You Rank? New to lifting and not sure where to start? We scoured BodySpace and pulled novice numbers for three big lifts. Check out these stats and see where you measure up. If you've ever suffered from shin splints, you know how they can leave you hobbling. Help prevent unnecessary pain and reclaim your smooth stride with these moves! Everyone gets tired of shakes once in a while. When it happens, eat your whey with these fitness-pro-approved snack recipes! Rest-pause is a classic training technique that can be used to increase size or strength. Get the best of both worlds with this new twist from Jim Stoppani, PhD!